The European Network on Statelessness has published today the Statelessness Index, which assesses how countries in Europe protect stateless people and what they are doing to prevent and reduce statelessness. In early October of the current year, Praxis warned about the situation of thirty-three families displaced from Kosovo facing a risk of becoming homeless after having been ordered to move out of the social housing in the suburban settlement “Beranovac” near Kraljevo. Praxis participated in the second meetingof the National Working Group (NWG) for Monitoring Public Administration Reform (PAR) in Serbia held in Belgrade on 26 October 2017. 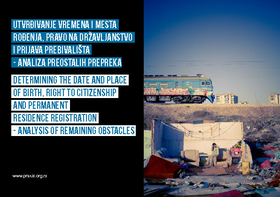 The report of the organisations European Roma Rights Center (ERRC), Institute for Statelessness and Inclusion (ISI) and the European Network on Statelessness (ENS)warns that the lack of documents has extremely negative consequences for the lives of thousands of Roma living in the Western Balkans and Ukraine. In the suburban settlement “Beranovac” near Kraljevo, the families are being evicted from the social housing apartments, which were built in order to find a durable and sustainable housing solution for the internally displaced persons from Kosovo. Today, we are celebrating the International Roma Day. Roma men and women are still the most vulnerable majority group in Serbia. The results achieved so far in improving their position have not yet removed some of the basic obstacles that impede their equal access to rights and inclusion in all social activities. 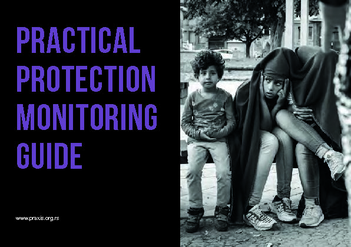 Within the project funded by Save the Children aimed at providing protection monitoring and assistance to refugees and migrants in Belgrade, Praxis has released a new publication - Practical Protection Monitoring Guide. On 13 December 2017, Praxis held a conference „STOP to Child Marriages and Statelessness“, accompanied by the exhibition of children’s drawings on the topic of prevention and elimination of child marriages. The conference was attended by more than 100 people including a large number of the authors of presented drawings. Today, on the World Children's Day, once again we would like to draw attention to the practice of child marriages in Serbia. The Council for the Rights of the Child, the body of the Government of the Republic of Serbia, appointed Jasmina Miković, the Deputy Executive Director of Praxis and the President of the Board of MODS, as their member in their new convocation. From 5-6 April 2017, the Eurochild membership gathered in Brussels for the annual General Assembly. The Network of Organisations for Children of Serbia (MODS) was represented by Jasmina Miković from Praxis, president of the MODS Management Board.